What is the Catalan for magic pony? Is the programme of the Catalan separatists a con? Yesterday Catalonia held elections for the regional government. Since Madrid frustrated their hopes of an independence referendum, the tactic of the secessionists has been to try to turn every election from rat-catcher up into an independence plebiscite. From that perspective, yesterday was not a win. Pro-independence parties narrowly failed to get a majority of votes. They did together win a narrow majority of seats, and will continue to control the Generalitat. That does not look a basis for UDI. The circumstances in the last few years could not have been more favourable to their cause: a disastrous boom-and-bust cycle in property, leading to bank rescues that doubled Spain’s national debt; mass unemployment from austerity dictated by Brussels and Berlin; and a governing party in Madrid mired in scandal. The economy has now started to improve, not dramatically but steadily, which should erode support. The pedestrian Mariano Rajoy (no pigs, no bribes) has opposed the separatists by standing pat on the constitution. This has given him institutional wins through the Constitutional Court, but has done nothing to win Catalan hearts and minds. There has been no counterpart to Gordon Brown’s spirited defence of the Union in Scotland on emotional grounds: shared battlefields and war cemeteries, and the NHS. (Imagine an American politician defending US healthcare as a glorious achievement. On second thoughts …) Can you make such a case in Catalonia? Sure. Catalans died in 1714 and 1812 and 1936 in defence of a particular vision of Spain, not just Catalonia. Bringing up the Civil War is dangerous stuff of course, precisely because the memories are high voltage. If the stakes are the unity of your country, you have to take a few risks. How serious is the independence project? I looked up the programme of Junts pel Si, the main separatist coalition in the election. Website, programme. The first thing that struck me is that while there is a button for a Castilian version of the 125-page programme, it doesn’t do anything. The party’s key document is not available in any language but Catalan. The electorate includes recent immigrants who only speak Castilian; the population includes foreign residents. The monolingualism suggests contempt for anybody who does not read Catalan. The programme would keep Castilian as an official language, but that’s clearly a purely formal concession. The animating spirit of secession is ethnic chauvinism. It is worth pointing out here that the separatists have no case on grounds of linguistic discrimination. Administration, schools, road signs, and the media are all run in Catalan, the co-official language. 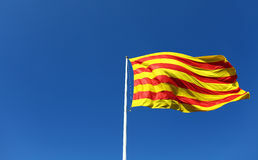 Catalan is the main language in Valencia and the Balearics, and a thriving minority one in Roussillon; none of these have significant separatist movements. Universities elsewhere in Spain don’t have programmes on Catalan: big deal. In an electoral document, not translating into English is narrowly justifiable. But the separatists must know by now that acceptance of the Catalan state would not be automatic. They badly need friends in Brussels, New York and national capitals. Who is going to read a long document in Catalan, any more than in Slovenian? Not providing an English version is an indicator of unseriousness. There is a much more striking one. The programme does not include the strings OTAN (the Romance acronym for NATO) or defensa in the military sense. Really. Has anybody told them that states have to defend themselves? The SNP in Scotland (5.3m) has a defence spokesman and a policy debate. They don’t expect an independent Scotland to spend nothing. The future of the Trident nuclear submarine base near Glasgow is a big issue. Spending 1.5% of GDP a year, similar to the defence spending of Denmark and Norway, would be £2 bn. Portugal (10.5m) spends a bit more, 1.8% of GDP, or $4bn in 2012. Catalonia (7.5 m) would need to spend $3bn a year or so to keep up with other small nations. Catalonia can’t therefore get into NATO by free-riding on its neighbours for defence. It could always pay Spain and France, which would be humiliating for the heirs of Jaime the Conqueror. Can it get into the EU without being in NATO? I’d be surprised. The problem here is not the contours of the defence policy. It’s that in a decade of intense, indeed obsessional, separatist agitation, it has apparently not occurred to the movement’s leaders to think at all about one of the central functions of a sovereign state. Much of the rest of the 125 pages is devoted to dozens of ways of spending this nice windfall: a minimum income, schools, higher education, health, environment, R&D, infrastructure, a fund for this and a fund for that. None of them are costed or prioritised. Oh, and income tax and VAT will be lowered. See the little problem? The assumption about the Spanish national debt is ridiculous. How does it become a cash inflow in the first place? Perhaps the idea is that Spain is being forced to run a large primary budget surplus, which baby Catalonia wouldn’t. But surely Catalonia’s share of this is already included in the tax outflow? So any reduction is already included there. In fact it’s the other way round. If you take on a share of the national debt, you become responsible for servicing it, capital as well as interest. If Artur Mas thinks that nice Herr Schäuble will allow this helpless, small new state of swarthy Mediterranean types knocking on the door of the EU to get away with not paying its debts, I have a nice temple on the Acropolis to sell him. The defence estimate assumes that Catalonia will inherit from Spain at no cost a share of the military assets like bases, ships and planes. If it has to buy these the estimate doubles, easily: a single new frigate can cost €1.5 bn. Second-hand, I dunno. I am also uncertain whether Schäuble does good days. Independent Catalonia could very easily be forced to raise taxes or cut expenditure. Hello, real world. Goodbye, magic pony. The gap between the separatist electoral programme and reality is so wide that I have to conclude that the separatists are either fools or con-men. For now, I’m going with the con-men. I’ve just realized there is something else funny about the Junts pel Si programme. Independence is their goal, we got that. Meanwhile, they have been elected to run from tomorrow the regional government of Catalonia, which has wide existing powers under the Spanish Constitution, and a long list of immediate problems starting with youth unemployment. What is their interim governing programme? They don’t say. (IIRC the SNP always did in elections for the devolved government in Edinburgh). The political problem is that presenting any such agenda – surely they can support farm cooperatives now? – would remind voters that actually the Generalitat can already do a lot of the nice things advertised as payoffs from independence. Perhaps most of them. It’s parallel to the post-Reagan Republican line: government/regional autonomy does not work, elect us and we will make sure. "El meu petit poni: l'amistat és màgia"
Well, that solves one problem. One of the time I was taking Spanish language courses in Barcelona I asked the matron of the host family, who was from Valencia, whether Valenciano was an accent of Catalan or Castillian. “NO!” She thundered, “Catalan and Castillian are accents of Valenciano, the true national language”. Wikipedia is clear that Valencian isn't even a dialect of Catalan, it is Catalan, just as standard AmE and BrE and IrE and NzE etc are varieties distinguished by only trivial differences. But if it's protected Valencian Catalan speakers from the conflict up the coast, the relabelling may have been worthwhile.